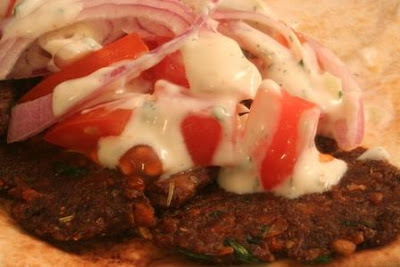 A few days ago kitsune_stars commented that she had used my tempeh burger recipe to make gyros. I thought that sounded like a fantastic idea. 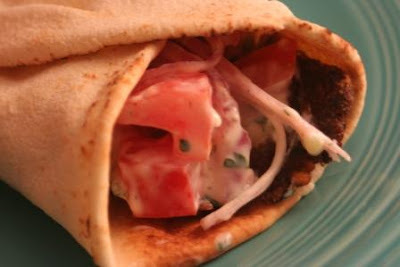 Of course, I have never had a gyro in my life so I have nothing to compare these to, but in my humble opinion they turned out really well. I did some online research and came up with this recipe. But, what to do about the tzatziki sauce? I did not have any soy yogurt, and I'm not sure that would have made this any better. I was very pleased with the result and managed to wolf down two gyro before dinner was over. 1. Grate tempeh and onion into a large bowl. Add in spices (including parsley) and soy sauce and mix well with a fork. Add flour and mix with fork, then knead with your hands for a minute or so until it all comes together. Add in a little water, if needed. 2. Heat a small layer of oil in a sauce pan over medium-lo heat. Break off golf ball-sized pieces of the dough mixture. Flatten with the palm of your hand on the countertop to mimic a slice of meat. Fry 2 mins per side. 1. Blend tofu, lemon juice, garlic, oil and spices together in a blender, or with an immersion blender in a container. 2. Place diced cucumber in a towel and squeeze out excess moisture. Add to sauce along with the parsley. Refrigerate until needed.